This entry was posted in Uncategorized on July 26, 2012 by Gary. I think the next couple of weeks and next Fed meeting are going to be a biggie. I’ve laid out the scenarios in the weekend report. I’ve also opened a $1 trial subscription for two days so everyone can access the report. If you don’t wish to convert to a monthly subscription just make sure you cancel auto renew before the second day by following the directions on the home page. This entry was posted in Uncategorized on July 14, 2012 by Gary. On one hand Europe is obviously in a recession. China is slowing dramatically, and the US economy is clearly in stall mode at best, and slowing rapidly at worst. That alone would suggest that a bear market has begun. On top of that, the S&P broke through its daily cycle trendline today (although it did manage to rally back before the close). A break of the trend line usually indicates that the daily cycle has started its decline into a cycle low. If this turns out to be the case, then this cycle would have topped on day 21 which gives it quite a few days to move down into the cycle bottom. (Average daily cycle length trough to trough is about 35 to 40 days.) If it does turn out that the cycle topped on the 21st day then there is a strong chance of testing the June lows at the next cycle bottom. On the other hand there are quite a few bullish signs that are popping up. For starters this is an election year. Does anyone really think that the politicians won’t pull out all the stops to try and keep the economy and markets inflated until the election? 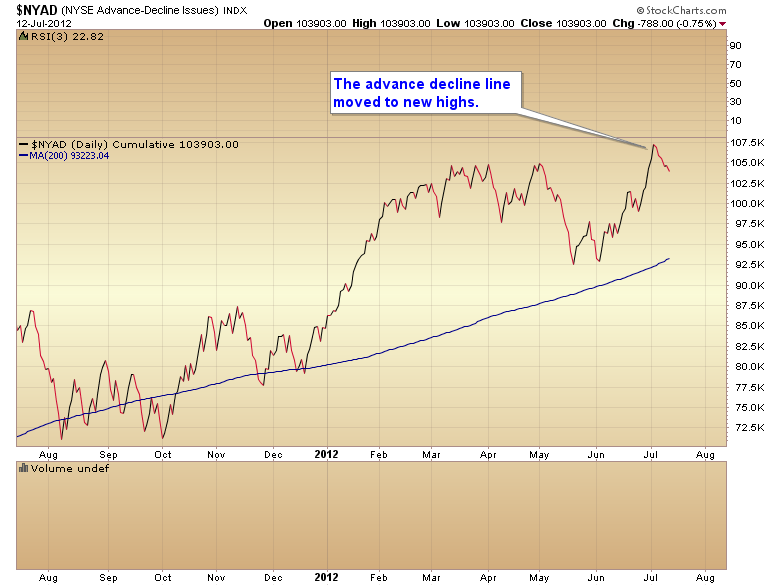 Next; the advance decline line managed to make a new high even though the S&P was still 3% below its 52-week high. 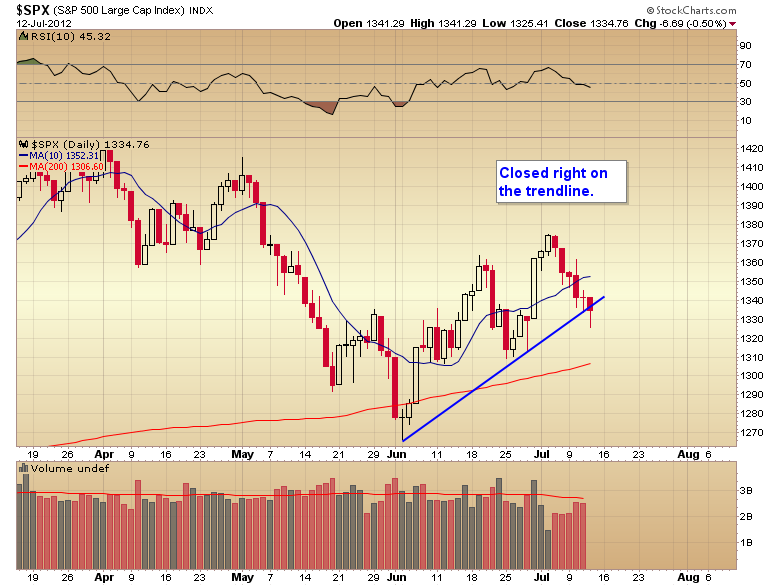 As Jason Goephert at sentiment trader.com has pointed out, this has almost always lead to new highs. As a matter of fact Jason noted that since 1940 there have been 13 similar occurrences and all but one led to the market making new highs within 3 months, on average within 18 days of the advance decline line breakout. Another positive is that the CRB’s rally out of its three year cycle low appears to be consolidating in a bull flag in preparation for another leg up. 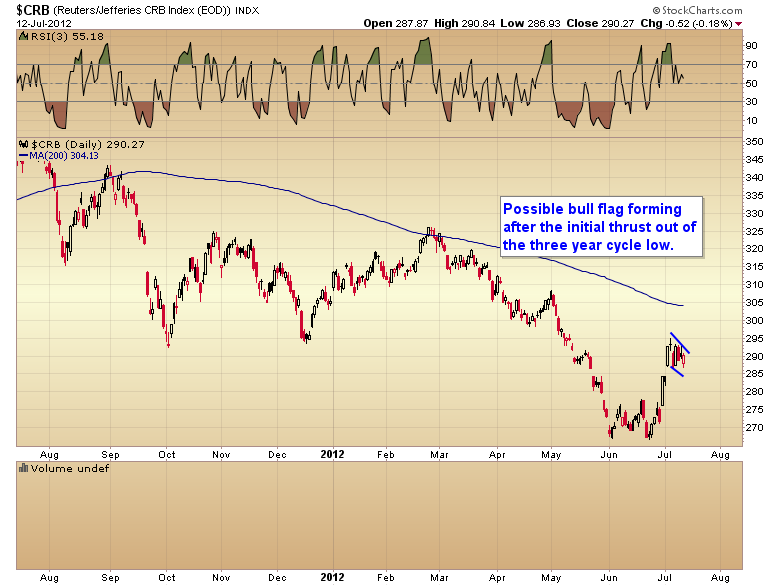 If stocks are caught in a bear market then the CRB should be rolling over rather quickly. Oil is also resisting the short-term weakness in the stock market and appears to be consolidating the initial $10 thrust off of its intermediate bottom, and preparing for another leg up. A different but related vein of thought is the US dollar index. Today was the 16th day of the dollars daily cycle (average duration 18 to 28 days). Which is just to say that it’s getting late enough in the cycle that the dollar should start to move down again any time now. And a major concern for bears would be any move lower by the dollar as risk assets tend to trade inversely. An even bigger concern is dollar sentiment. It’s currently at levels that have generated intermediate tops almost without fail in the past. The fact that we still haven’t seen a left translated daily cycle out of the dollar makes me think that the dollar still has an intermediate decline ahead of it. Considering that this week would be the 17th week in an intermediate cycle that usually runs 18 to 25 weeks and there’s a good chance that this sentiment extreme is going to force an intermediate top as soon as this daily cycle runs out of steam. 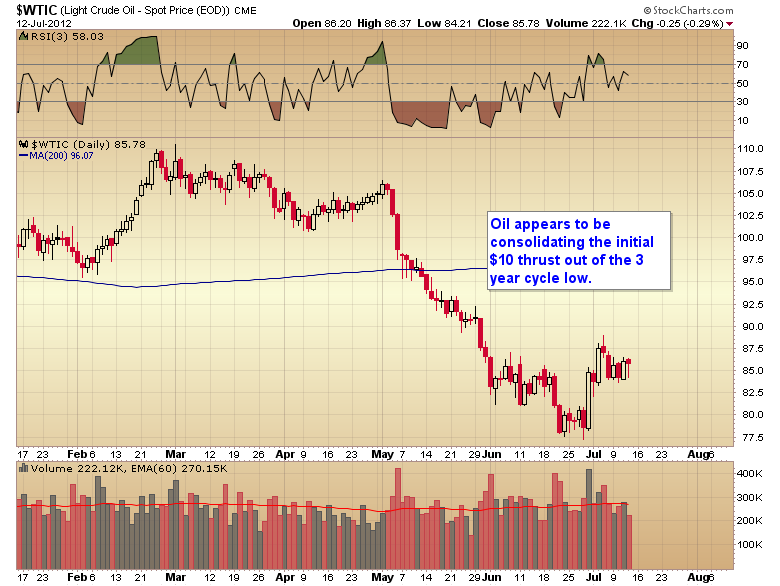 A possible negative is the fact that gold seems unable to gain any upside traction in this new intermediate cycle. 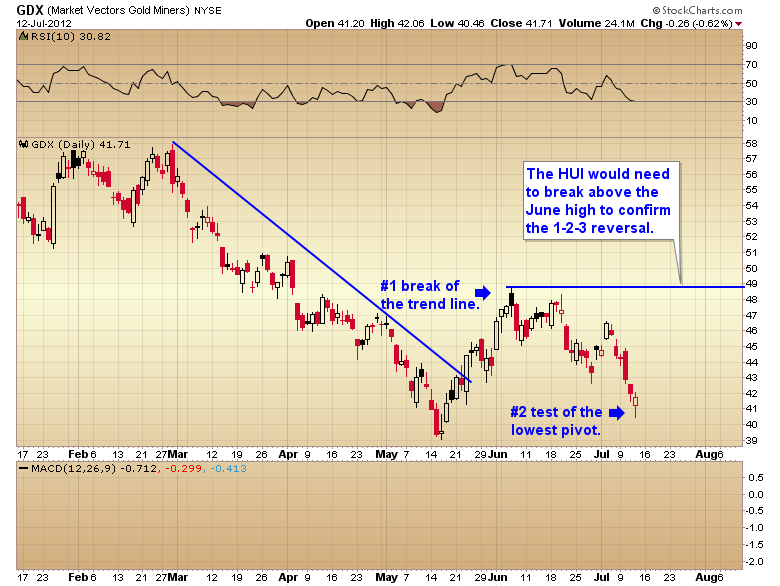 If the CRB has formed a three year cycle low why isn’t gold generating any upside momentum? If gold were to drop below $1547 it would indicate that a left translated daily cycle is in progress, and as many of you know a left translated daily cycle often indicates that the intermediate cycle has topped as well. Another negative is the fact that mining stocks as represented by the GDX ETF did move below their prior daily cycle bottom. The one small sign of hope is the reversal today, which if it holds above the May lows could indicate that miners are just moving through a 1-2-3 reversal and this was just the #2 test of the lows. Of course we won’t know whether this is in fact what is happening until miners either break below the May bottom or move back above the June high. For the bulls the S&P needs to move above 1375, The CRB must generate another leg up, and gold must make a higher high by reclaiming the $1622 level. Those are the bullish lines in the sand. For the bears they need to see the stock market drop below the half cycle low of 1310, The CRB must break downwards out of the consolidation, and gold has to drop below $1547. This entry was posted in Uncategorized on July 13, 2012 by Gary. This entry was posted in Uncategorized on July 10, 2012 by Gary.